Whether you are an inventor with potentially valuable intellectual property or a Fortune 500 company with a large, sophisticated intellectual property portfolio, we provide expert and cost-effective representation in relation to IP disputes and litigation. When an IP dispute arises, we partner with our clients to determine the best course of action based on their business, legal, and budgetary goals. We have a track record of successfully resolving IP disputes in the areas below. As examples of our work in these areas, one team member acted as lead negotiator and legal counsel for a multimillion dollar copyright and trademark licensing agreement. We also represented a nationally-recognized home furnishings brand in a copyright infringement action against the world's leading carpet manufacturer, which resulted in a jury verdict of willful infringement. In the area of patent litigation, we defended a biotech company accused of infringing patents concerning kits used to track mutations in the HIV genome. We also represented a lighting technology company in the enforcement of patent portfolio related to LED power electronics. Our IP Litigation team has experience with domain name disputes under the Uniform Domain Name Dispute Resolution Policy (UDRP) and Anticybersquatting Consumer Protection Act (ACPA) and before ICANN-approved dispute resolution service providers. We also provide advice on issues relating to keyword advertising and social media, and generic top-level domain (gTLD) issues including use of the Trademark Clearinghouse. We have represented clients in trade secret, unfair competition, and false advertising cases in state and federal courts throughout the United States. Some of our recent work includes the successful defense of a cloud computing and data distribution company against trade secret misappropriation/employee lift-out claims in New York, and the successful defense of an importer of consumer goods against unfair competition/Lanham Act claims by a competitor in Massachusetts. Most recently, on behalf of our client Vans, Inc. and five other companies, we won summary judgement against claims alleging trade-dress infringement and unfair competition. Partnering with our patent practitioners, our IP litigators have broad experience representing and counseling both patent owners and petitioners in USPTO proceedings, including inter partes reviews and post-grant reviews (including covered business method patent reviews), ex parte reexaminations, interference proceedings, and other post-grant proceedings. Recognizing that post-grant proceedings require diverse skill sets, we believe that our clients obtain the best results when attorneys with deep knowledge of the Patent Office and the underlying technology collaborate with attorneys having strategic and tactical litigation expertise. Our litigators are some of the best in the country; many are recognized by Chambers USA and Best Lawyers in America as being the top professionals in their fields. Our team members present on IP issues before organizations such as the American Bar Association, the Boston Bar Association, the New England Bar Association, and the American Intellectual Property Law Association. One member of the team is currently lecturing a class on negotiation for Harvard Law School, another has been included in the World Trademark Review 1000 for the past five years, and another recently crafted a creative and successful joint defense for 108 banks and credit unions against claims that the ATMs they were using were infringing on patents. 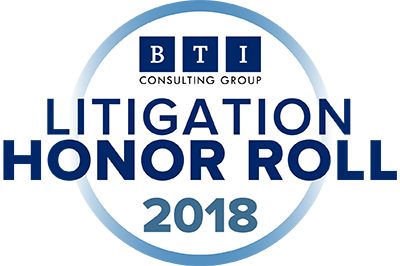 Corporate counsel rank Pierce Atwood in the top 20% of all law firms in IP Litigation in Litigation Outlook 2018: Changes, Trends, and Opportunities for Law Firms. BTI Consulting is the leading provider of strategic research to the legal community. Results based on direct feedback from 350 independent, in-depth interviews with corporate counsel at the world’s largest companies.